These beautiful folding doors can open up your home like no other door can, thanks to their large glass panels. Not only do these sleek panels allow your living space to be flooded with natural light and provide a scenic view of any garden; they will also allow your inside and outside space to work as one combined area. You may believe that a high amount of heat is lost through the large glass panels in these sliding doors. However, their advanced profile technology creates a thermal transmittance barrier between the warm inside and the cold outside. Which keeps your home warm and comfortable even in the coldest weather and also helps to reduce energy bills. You can create the Bifold Doors you have been dreaming of with Smart Aluminium Bifold Doors and their range of personalised options. With as many as 7 opening sash styles being available, all with different configurations, and a total of 2 different RAL colours to choose from, you will be spoilt for choice. •	The Bi Folding doors are fitted with a multi-point and shoot-bolt locks providing a stern resistance to attack. •	The security of these glass doors have been tested to British security standards, allowing you piece of mind that you and your belongings are safe within your home. •	To stop any unwanted water or drafts entering your home these Bifold Doors are fitted with high quality gaskets and weather brushes. •	The sashes can be glazed with a range of double or even triple glazed sealed unit’s depending on your needs. Compared to double glazing, triple glazing will reduce energy loss and enhance the doors ability to block out noise. •	The latest weather resistant and thermal technology ensures that your new sliding doors will help stop heat from leaving your home, as they can reach a U-value as low as 1.5*. •	Colour matched accessories are available with all Smart Aluminium Bifold Doors, letting you design your perfect sliding door. 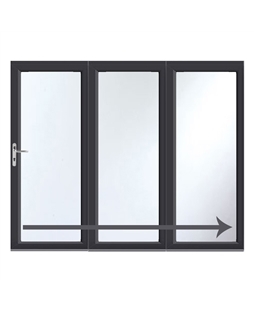 Our Smart Bifold Doors are available in RAL Colours Anthracite Grey and White. The prices displayed are for installation into a virgin reveal only. Unfortunately we are unable to undertake any building work. The maximum height of Smart Bifold Doors is 2500mm, with each leaf with having a maximum width of 1200mm and a total max length of 8400mm. If you need a door that folds open effortlessly, whilst also following the traditional style of your home, then your need Smart Aluminium Bifold Doors in Gloss White. Not only are these doors weather resistant, they will also help keep your home warm and your heating bills down. With up to up seven leafs to choose from, all with different configuration options and colours, you are bound to find the perfect folding doors. 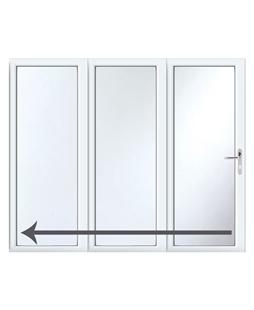 The maximum height of Smart Aluminium Bifold Doors is 2500mm, with each leaf with having a maximum width of 1200mm and the total maximum width of the door being 8400mm. If you want a door that floods your home with light, whilst also adding a modern style to your home, then your need Smart Aluminium Bifold Doors in Textured Anthracite Grey. Not only will these folding doors provide a beautiful view, they will also provide easy access to your garden or patio.